Our high-quality, steel-constructed campfire grills all feature our unique one-inch raised edge that prevents food from rolling into the campfire. Each grill also comes with an easy-to-clean nylon carrying case! See why our durable, steel-constructed grills are becoming the number one choice of campers and adventure seekers everywhere! Please complete the order form and we will send you a PayPal invoice which can be paid using a PayPal account or by using your credit or debit card. Cooking over a campfire – thinking outside the marshmallow box…. No matter where you are or what you are doing, a meal cooked over and eaten around a campfire is surely one of the highpoints of being in the great outdoors. No need to compromise on taste, what could be more delicious than food that’s been cooked over an open wood fire? What makes our campfire cooking grills so good? By allowing you to cook in lovely wood smoke, an ingredient in itself, this essential piece of kit can provide you with many delicious meals. My grill has taken a permanent position in the boot of my car so it is always close at hand for cooking on any beach or inviting field. Excellent for grilling fish, vegetables and small joints, it can also be coupled with a sturdy pan and lid to provide a good little stew or pot roast. For more recipes and inspiration for outdoor cooking check out the NEW Cool Camping cookbook featuring our campfire cooking grills. What are people saying about our grills? "By allowing you to cook in lovely wood smoke, an ingredient in itself, this essential piece of kit can provide you with many delicious meals. My grill has taken a permanent position in the boot of my car so it is always close at hand for cooking on any beach or inviting field. Excellent for grilling fish, vegetables and small joints, it can also be coupled with a sturdy pan and lid to provide a good little stew or pot roast." "Our bank holiday weekend get together was a great success. I was nervous about having to feed 12 children and 14 adults with nothing but a pile of wood and our newly purchased NEW Original campfire grill. I am delighted to report that it worked wonderfully well. I had been concerned about the sturdiness of the platform but the supporting pole was very solid and resulted in a lovely level and sturdy grill. I comfortably managed to feed all 28 of us lunch, dinner and breakfast. Watching the sun come up with my 5 year old son, just the two of us huddled round the campfire with some bacon sizzling away was a truely magical moment." "We had a brilliantly successful fire pit BBQ on Saturday evening - it began in the pouring rain, continued through sunshine and a double rainbow, and ended under a moonlit sky - fabulous! The camping grill was a triumph - it works even better than it looks and it looks wonderfully stylish, sturdy and robust. 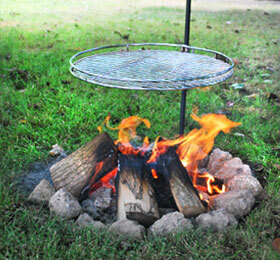 Being able to swing the grill away from the fire proved very simple and incredibly useful. It's everything we had hoped for - thank you!" "We first used the Campfire Grill this summer when it was available to hire at Forgewood Campsite in East Sussex. It was an amazing success and satisfied our desire for a roaring fire and cooking proper food on it. We bought one for ourselves as soon as we returned and it really has changed my husband from a reluctant camper to a happy camper! We would recommend it to anyone who believes that you don't have to sacrifice the quality of you cooking just because you are outdoors." "The grill is very well made and not 'tinny' like so much modern barbecue kit, plus it flat packs brilliantly. We are non car owners but we do cycle to a local campsite that allows campfires. Our set up involves 2 x bicycles and a trailer. 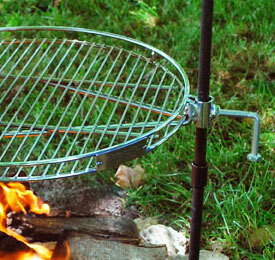 The grill can be carried in our kit as well as a conventional camping stove. giving us two cooking appliances that we can carry with minimal effort. It is a real pleasure to find something in this modern age where quality hasn't been compromised. Properly looked after I can see this grill lasting for many more years than I've got left (I'm 56). Finally, like all the most important inventions its concept is simple making it brilliant." "We used our NEW Original Grill at a Dads and Lads camping weekend with 30 hungry males! Really excellent product and very impressed - just need to get my wife to agree to me building a campfire in the middle of the lawn now to barbecue on!" 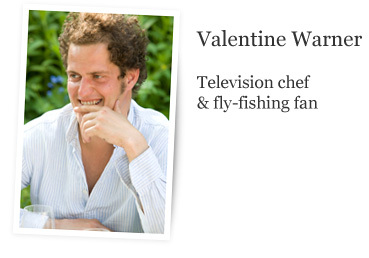 "Just back from Wowo and the grill was fantastic. The surface area of the Pioneer was big enough for the four of us and also easily took the weight of our camping pots and pans as well. It didn't require much trial and error to judge how high or low food had to be but the turning handling does heat up so the free glove was a bonus to have. Even the kids were able to place and turn the food on the grill by using the 360 degree rotation and cleaning it was easy. We wire brushed it over the heat and let the excess burn away. In the morning the grill was free from greasy debris. The design was great for tricky foods such as sausages as they neither rolled off or required foil to hold them in place. The only thing we placed on foil was some fish as it was a fillet and required less direct heat to cook and you can do this by ensuring one area of the grill is not directly above the flame. This is also comes in handy for keeping food warm. The grill is easy to set up, use and travel with. It's a shame more campsites don't allow fires as with the correct fire pit it's not any more of a danger than a BBQ." "We've just returned from a weekend of camping and we used our campfire grill for the first time - it was brilliant! We really liked it - it was so easy to use and perfect for our campfire. My boyfriend said he would give it 10/10." 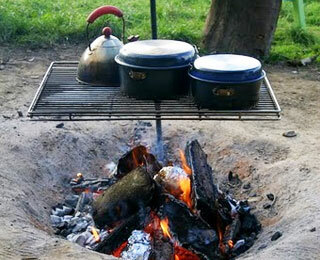 Campfire grills are available to try out at the following campsites - so you can try before you buy.